I've been trolling the forum and learning much from everyone's experience. Thank you for that. My primary outings locations will in Virginia Lakes (Lake Anna), Patomac River basin south of DC, and sound side of OBX North Carolina. Has anyone been harassed by DNR in any of these area for having >2 people on board? Our TI's were our only family boats since 2010, we have a big family and often had 4-6 people on the boat, (kids and adults), and yes we exceeded the max weight quite often, but never in unsafe water, ( we always snorkle and dive off the boat. We have been pretty much everywhere (mostly in swfl and the keys), but we have traveled all over the country, (couple hundred thousand road miles). Never got hassled not even once in 7 yrs, most weekends. Edit: I interpret the capacity to be for the kayak, (which is the minimum configuration) not the entire boat with ama's and tramps. Just explain the boat is expanded/modified from it's base configuration. Last edited by fusioneng on Mon Feb 05, 2018 5:04 pm, edited 1 time in total. I sailed way over the weight limit and the performance definitely does decrease. I had two teenagers about 130-150lbs and one 13 year old who is over 200lbs 6ft plus, and then me, 180lbs. You will definitely see an increase in water intake; water was up to my seat. I have a the newer ct seats and that is saying something about the water intake. The police and coast guard don’t usually harass me about how many people are in my ti but they always check if we have our life jackets on. I've had up to four people (under 600 lbs total) onboard my TI with no significant performance issues (two in the seats and two on the tramps). However, due to the capacity sticker I've been turned back to shore by local police water patrols. I resolved this problem by covering the entire deck with Hydro-Turf, including the sticker. I haven't had a problem since. However, I do this at my own risk and would never recommended it to anyone else. In 1973 the US Coast Guard effected a regulation, Title 33, Code of Federal Regulation, Section 183, requiring all monohull boats under 20 ft to carry a plate posting the Maximum Weight Capacity, Maximum Persons Capacity and Maximum Horsepower Ratings. However, sailboats, canoes, kayaks, and inflatable boats are not required to include a capacity plate. So the TI is not required to have the sticker, but since Hobie includes one it is technically not permitted to remove it or cover it up. This is a real Catch 22 and can be very frustrating to someone who wants to safely use the TI with more than one passenger. By including a sticker that clearly permits only two people onboard, Hobie inadvertently causes many people serious issues with legally carrying more than one passenger, yet they inexplicably show up to five people onboard the TI in many of their own advertisements which makes no sense. So they may be violating their own sticker and technically may be at odds with Coast Guard regulations depending upon the interpretation. You'll need to decide what you want to do. If you buy a TI and wish to carry more than one passenger you also may technically be in violation. This may or may not cause you issues depending upon how your local law enforcement officials interpret the sticker. The sticker says 2 Passengers or 600 lbs which is somewhat ambiguous. It's up to the law enforcement agency that inspects you as to exactly how this is applied. They may have a policy or it may be up to the individual officer that inspects your boat. Any particular sailing locations where you've had the run-ins with the water patrols? I'm the kind of person to ask for forgiveness instead of permission. I like the idea of the Hyrdo-Turf. Do you have any pictures of how that looks on the TI? Lake Champlain, which is heavily patrolled by local State police and the US Coast Guard. Sorry, I don't have any photos of the Hydro-Turf installation and my TI is currently stored away for the winter in a place I can't get to. However it was one of the best mods I did. It made the boat more comfortable and much less slippery, and it looks great. I highly recommend it as an improvement, but again I would never recommend that anyone hide their sticker. I don't know what the penalty is. Usually I play by the rules, but this was driving me crazy. Nothing worse than having your family out for a nice day of boating and then be told you have to go right back to shore because of some unreasonable interpretation of a capacity sticker. I bought my TI last year for the same purpose as you and same concerns. My daughters are 8 and 13 at this point in time. All in with the 4 of us,we're probably 450 to 475. I find light wind sailing no problem. Performance is different for sure with added weight, but it works, if you're expectations are reasonable. My wife isn't a "high adventure" sailor so it's perfect for us. 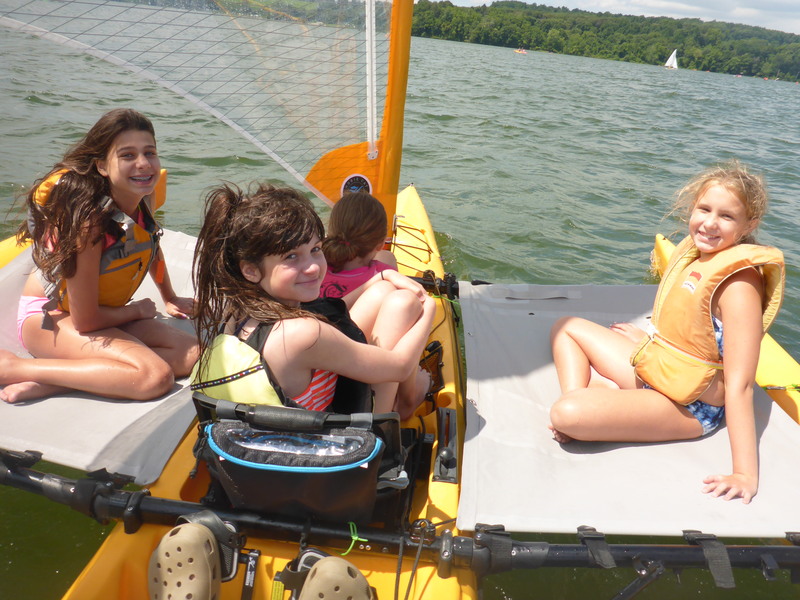 We mostly sail at a local reservoir in PA. Lot's of rangers on patrol there, but they have never once come over to talk to us, even with like 5 or 6 people on it (1 adult, 2 teens, 3 smaller kids). The key here to not get approached is everyone was clearly wearing a PFD. If they see everyone is wearing a PFD, they usually don't even come over. The other thing we have going for us at this location is that they rent WindRiders there which are trimarans that have a 6 person capacity, so they are used to seeing similar boats loaded up like that. We do an annual trip to OBX (Rondanthe) and last year had our TI with us for the first time. The house we rent is sound side so we just head right out. In all the years I've vacationed there (10+) I've never once seen any type of patrol. Again though, the best way to avoid a close inspection it make sure everyone is clearly wearing PFDs. If no is wearing them, you're inviting them to come have a closer look. With all the Kayak Fishing I do in my Outback I've just gotten used to wearing the PFD in all weather conditions and the kids and wife as well. I just recently had a discussion with a local Police Marine Unit on the Potomac River, and they said that while they understood the problem, the manufacturer would have to issue a revised Capacity Plate for it to be legal to carry more than indicated on the capacity plate. While it is not likely to be a target of enforcement activity, you could be cited. I seem to recall we've had this discussion before, and Matt Miller pushed back on a revised Capacity Plate or similar solution. Given the increased enforcement in some locales combined with Hobie's continued marketing of the TI showing more than 2 persons on board, I think it's time for Hobie to revisit the issue. A revision to the capacity plate or at least an auxiliary sticker indicating a higher limit when amas and trampolines are in place would be a good idea. 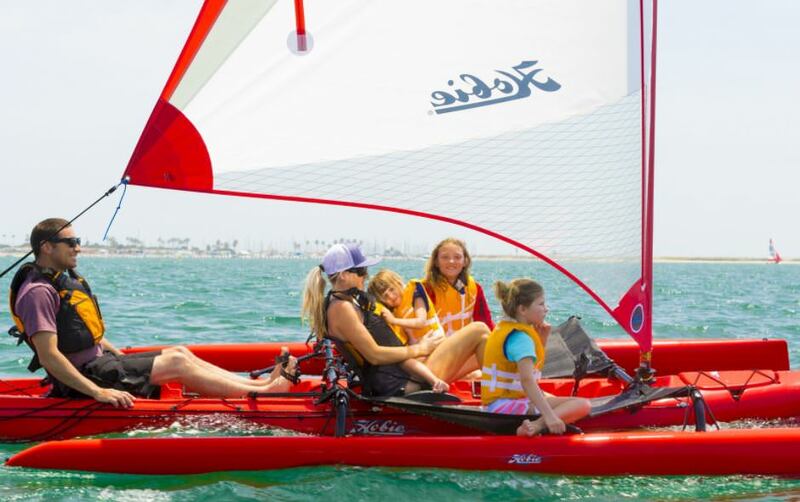 The continued presence of non-compliant activities in photos in Hobie's marketing would appear to open them up to litigation. I sail in the Potomac near Colonial Beach all the time, with more than 2 on board quite often. Never had a problem. I also do the soundside in the OBX a few times a year, albeit way down south in Ocracoke. No issues there either. Not saying that it would never happen, I just think the DNR guys have bigger problems to deal with. We often had our TI’s way overloaded, but were always careful to not take the boats way out offshore in rough conditions when loaded down. We would mostly be out in really flat water with near no wind, usually snorkling and diving just offshore. If going far, (Island hopping) we would hook up our inflatable 4 person dingy and tow that behind, ( big catch coolers, food coolers, scuba gear and tanks, etc. If we had extra people we typically had them hang onto the dingy, or towed via ropes, on inflatable and regular kayaks, sometimes in a string of 3-4 kayaks directly behind the TI. BTW you can’t steer with a bunch of kayaks hanging onto the TI, (fyi), towing straight behind 15 ft back doesn’t effect steering much at all. The TI makes a great mothership. Or you can do what we tried to do and outrun the Shore patrol, unfortunately they had a 32ft gofast Scarab, they all laughed when I told them that, they just wanted to check out our cool boat, and made sure we all had pfd’s. They aren’t out there to get us, they just want to make sure everyone is safe. I'm not sure what else they would have said? Our local lake regularly has TI's on it with 4 people and no one bothers us or them. However, if I invited a warden over and said, "hey look at his capacity sticker, are you OK with us blatantly exceeding it?" I would fully expect them to tell me that I couldn't and would be cited if I did. Saying anything otherwise would make them liable if something happens. I get it, it's not like you want to spend $6,500 and then be told you can't do what you want. But I think it's fairly low risk is you don't invite and inspection. If you have a chance would love to see the pictures of the Hydro-Turf mod pro10is. This is the problem in a nutshell. The law enforcement agencies, in general, do not want to spoil your day or be unreasonable, but there you are with four people on a boat with a capacity sticker that says only two people. So their options are to look the other way or to enforce the regulations. This puts them in an uncomfortable position. When I was first turned back to shore, the officers apologized and said they had no choice. The next time it happened one of the officers on board remembered me and said if it happened again they would have no choice but to write me an expensive ticket. After I covered the sticker, the problem vanished and I was never bothered again. I think they were actually relieved I covered it so they were then off the hook. They would only check that everyone had a pfd and wish me a good day of sailing. It's all about that ridiculous sticker. Since it is not required by law, Hobie should either remove it or revise it, but I'm quite certain they will do neither. How did you go about covering the sticker?